There are two main reasons for electric panel replacement in your Spokane home. One is to change from fuses to a circuit breaker panel, and the other is to increase the electrical load. With all the new appliances and technical devices we now have in our Spokane homes, we find that older homes might not have sufficient power available to handle the increased demand. Therefore, an electrical panel replacement or service upgrade is required. Our Spokane electrical panel replacement specialists note than the most common signs your home’s electrical system is in need of an upgrade include: flickering lights, blown fuses, tripped breakers, appliances randomly shutting off, unexplainable power outages, and outlets and switches that do not work. For any electric trouble or repair, please call Handyman Electric, LLC today. 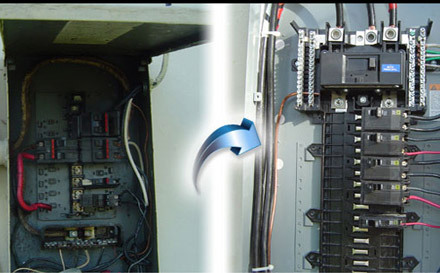 If you are looking for electrical panel replacements in Spokane, WA then please call 509-993-0303.